After six years as Curate in St Joseph’s SMA Parish, Blackrock Road, Fr Eugene McLoughlin SMA bade a fond farewell to the people of the parish at a Thanksgiving Mass on Wednesday, 22 June. Fr Eugene is also celebrating the 25th Anniversary of his Ordination to the Priesthood. 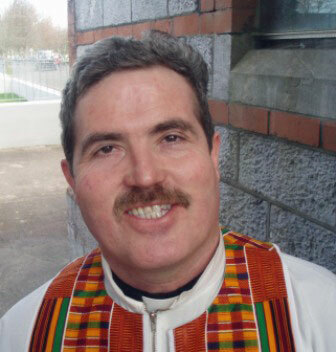 Since then he has served as an SMA missionary in Liberia, Zambia, England and the two SMA parishes in Cork City. The Mass was concelebrated by Fathers Tommie Wade (on right in above picture) and Tony Butler (on left). 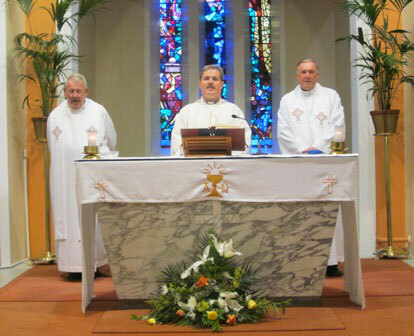 Fr Eugene sees his celebration of the 25th Anniversary of his Ordination as a priest as also a reason to give Thanks – to almighty God who has given him the grace of a vocation, to his family and freinds, to the people of the Blackrock Road SMA parish and all those who had touched his life during the last 25 years. Some of them have gone to God, including his dear parents. But from their place of rest they are, no doubt, praying for him as he moves on to a new phase in his life. This begins with a Directed Retreat at the SMA Retreat & Conference Centre, Newry on Friday after which he, and his classmate Fr Noel O’Leary SMA, will attend the official SMA Silver Jubilee celebration. After a holiday at home with his family, Fr Eugene begins a Sabbatical Year during which he will have time to rest, pray and update himself on some current theological and other issues. 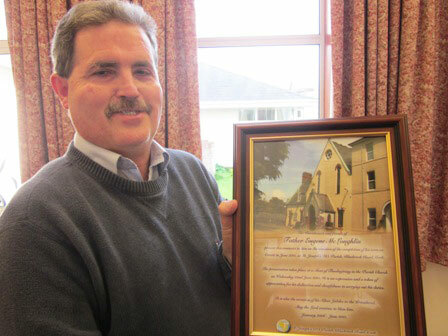 At a presentation after the Mass, Fr Eugene was presented wih several gifts, including a framed photo of the parish Church – a gift from the parish- as well as a beautiful Crystal piece on behalf of the Parish Choir. Last week the SMA Community Leader thanked Fr Eugene for his many services to the SMA community, particularly his singing on a Thursday morning with the more senior members of the community. No doubt Fr Eugene will continue to sing in praise of the Lord. Ad Multos Annos!